Here comes a brand new, updated edition of this best-selling book for any keen vegetable grower, demonstrating acclaimed gardener, Ed Smith's, unique system for growing high yield organic vegetables at home. A comprehensive guide to growing your own fruit and vegetables, it is full of practical advice about everything from building raised beds, planning your veg patch to making your own compost. 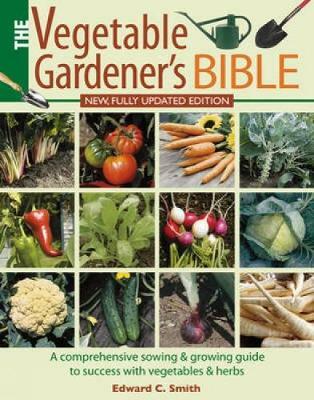 Learn how to make the most of your garden and grow vegetables to feed your family and friends. Smith's easy-to-follow techniques will ensure you get maximum yields for less work. It includes a much expanded plant directory with a focus on specific fruit and vegetables and how to grow them, as well as tips on harvesting and storing techniques. "The book by my bed is one of the most American gardening tomes ever published, Edward C. Smith 's "The Vegetable Gardener 's Bible." " The New York Times Book Review"
"Smith...clearly explains everything novice and experienced gardeners need to know to grow vegetables and herbs using his system of wide, deep, raised beds." " Library Journal"
"An abundance of photographs...visually bolster the techniques described, while frequent subheads, sidebars and information-packed photo captions make the layout user-friendly...[Smith's] book is thorough and infused with practical wisdom and a dry Vermont humor that should endear him to readers." " Publishers Weekly"
"There are 550 color photographs that complement the informative text." " Booklist"